Searching for gorgeous bridal accessories at a steal of a deal? Next weekend is the moment you’ve been waiting for…it’s time for Bridal Styles Boutique’s annual Summer Sample Sale! On Friday, July 20 and Saturday, July 21, select pieces from our dazzling collection of bridal veils, headpieces and jewelry will be marked down up to 75%. 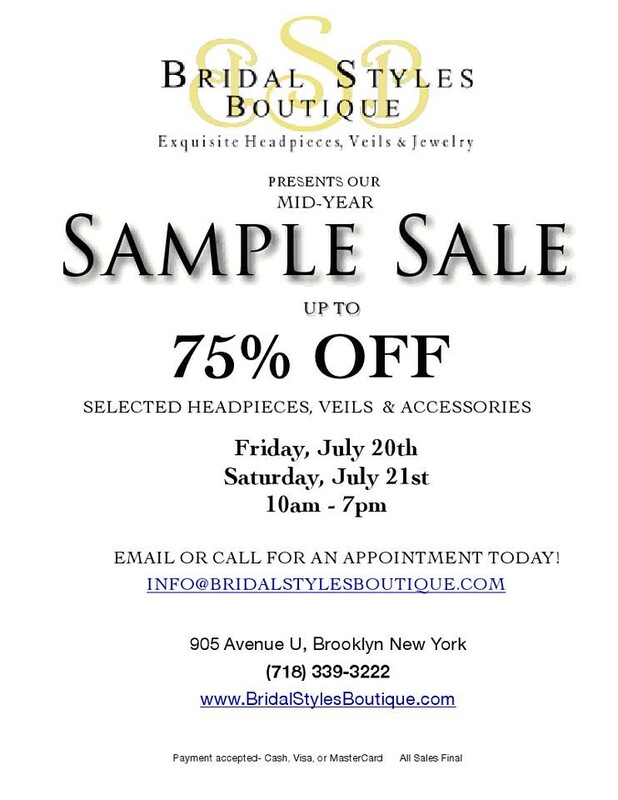 Our Sample Sale is by appointment, so be sure to email info@BridalStylesBoutique.com or call 718-339-3222 to book yours. This entry was posted on Sunday, July 15th, 2012 at 10:25 am	and is filed under Announcements, Events. You can follow any responses to this entry through the RSS 2.0 feed. You can skip to the end and leave a response. Pinging is currently not allowed.